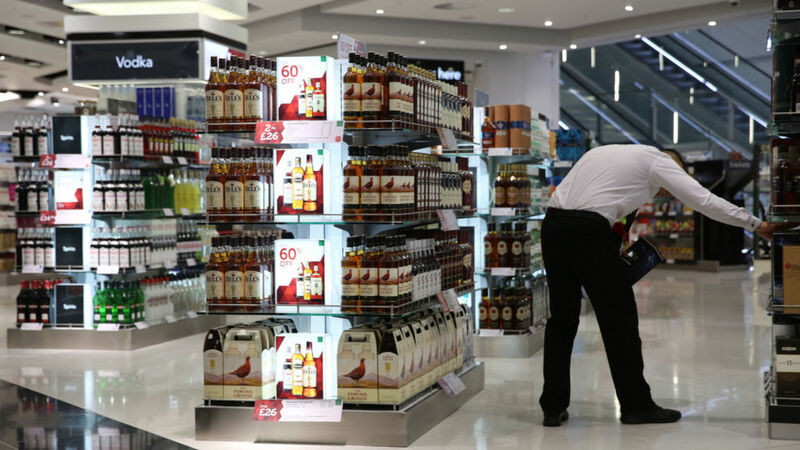 A Duty Free shop is seen in Terminal 2 at Heathrow Airport in London British airports are facing a crackdown on alcohol sales following a spate of incidents involving drunken passengers. The new aviation minister Lord Ahmad said he did not want to “kill merriment altogether”, but insisted plane passengers need to be “responsible” when flying. He has announced he will be examining the way alcohol is sold in airports, so that people travelling for business or families going on holiday feel “safe and secure”. The peer has also pledged to ensure the way in which unruly travellers are stopped from going through airport departure gates is “fit for purpose”. His predecessor, Robert Goodwill, revealed last year that several airlines had written to the Government to warn about the number of alcohol-related incidents. Latest statistics show that between March 2014 and March 2016 at least 442 people were arrested on suspicion of being drunk on a plane or at an airport. Lord Ahmad said: “If you’re a young family travelling on a plane you want to go from point A to B, you don’t want to be disrupted. “I don’t think we want to kill merriment altogether, but I think it’s important that passengers who board planes are also responsible and have a responsibility to other passengers, and that certainly should be the factor which we bear in mind. In February six British men on a stag party – including the groom-to-be – were arrested by German police after a mid-air brawl forced a Ryanair flight from London to Bratislava to divert to Berlin. One of the men took off his clothes mid-flight and the group became aggressive after they were refused alcohol. In May, a female passenger punched an easyJet pilot in the face after being ordered to leave an aircraft before it took off from Manchester. Tim Alderslade, chief executive of the British Air Transport Association, and Ed Anderson, chairman of the Airport Operators Association, said in a joint statement such incidents are “a very rare occurrence”, but warned they can lead to “serious consequences”. A code of practice on disruptive passengers was published earlier this week. The zero tolerance approach includes airport shops advising passengers not to drink alcohol they have purchased before or during their flight, and training staff in bars and restaurants to limit or stop the sale of alcohol to prevent or manage disruptive behaviour. Glasgow and Manchester airports have trilled a scheme with shops selling alcohol in sealed bags in a bid to reduce problems on flights.